Writer's Desk™ v. 6.01 is a Windows XP/Vista/7/8/10 writing environment designed for creative writers. If you have chapters, notes, papers, or any writings spread across multiple files, you can use Writer's Desk™ to free your creative mind from your computer. Edit your writings in Word® DOCX, RTF, and TXT formats. Combine related files—chapters, stories, class papers, articles, poems, etc.—into a project for easy management. Include support files in DOCX, RTF, TXT formats for viewing or editing. Include support files in other formats (XLS, PDF, JPG, etc.) to open with associated programs. Minimize thinking in computerese and using the operating system while writing creatively. Write chapters, essays, articles, etc., in individual files; then merge into a single manuscript. Open all creative files, all support files, or all files in a project with a single click. 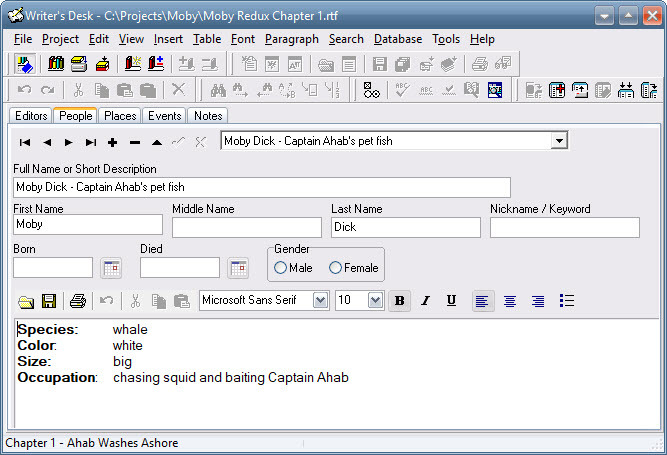 Move from file to file by clicking notebook tabs or titled icons in the project diagram. Copy or move all files at once even if they are scattered on disk. Easily import Word® files still in the old DOC format. Think of the right English word easily with Active Thesaurus™. Use any one, or any combination, of 19 other spell-check dictionaries. Search with a single click all open files or all files in your project, open or not. Use any of four searches: plain text, approximate, sound-alike, or regular expression. Whether you are writing fiction, non-fiction, class papers, or research notes, operating a computer can heavily tax your creative mind. You are trying to think of your writing. But operating your computer is an interruption to creative thinking. Writer's Desk™ helps to put your computer in the background as you write by centralizing and managing your files as a unified project. 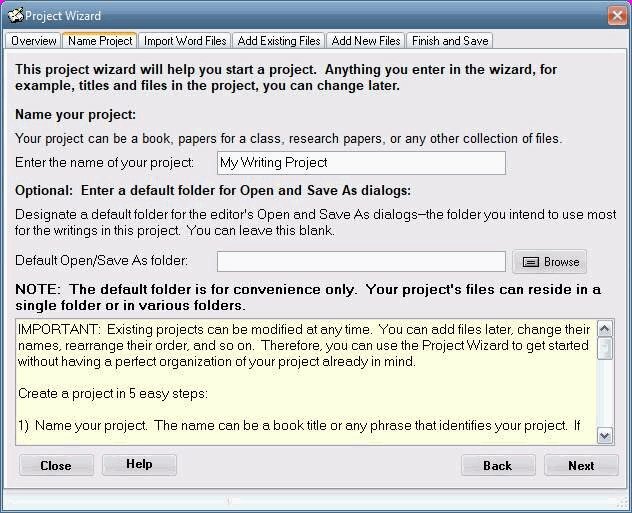 or use the Project Editor to create or modify projects. There are other easy ways to create or modify a project: see some in screen shots. Now you have control of your writing project. Open any number of your project's files. People, Places, Events, and Notes. Double-click any word for the Active Thesaurus™.